I am so happy that I found The Singham Bloodlines series and absolutely thrilled to share with you all my heartfelt rave about these beautifully written books. 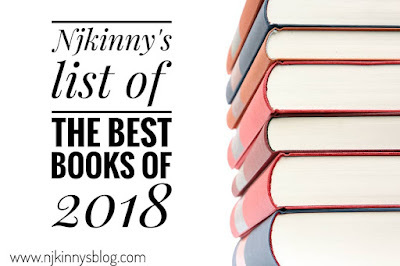 Read on to know why Bound by Hatred came to be in Njkinny's List of The Best Books of 2018 and go grab this book to read! The Singham Bloodlines series is a splendid and one-of-a-kind series that has become one of my favourite series of all time. 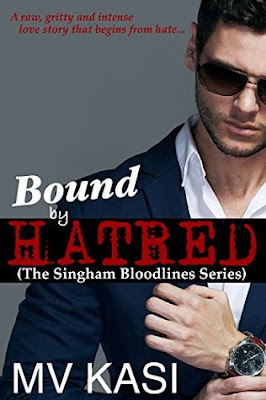 When I read Bound by Revenge which is the first book in this spellbinding series, I fell in love and didn't think the author could write a better book but wait till you read the second book in the series, Bound by Hatred. This book is a class apart from all other romance books that I have read. Raw, edgy and brutally honest, the emotional play in this book shook me to my core and my heart broke for the protagonists - one who had so far come across as a cold-hearted villain and another a carefree casanova. While the book can be read as a standalone, I would recommend that you read the books in order so as to understand the world, the background stories and the protagonists' characters better. I absolutely adored this book and obsessively read it in one sitting. No one and nothing got me out of the story once I started and then my family will attest to the fact that after finishing the book, no one and nothing could stop me raving about the beauty of the story! The story is beautifully narrated and the twists and turns so unexpected that I got goosebumps as I travelled with the protagonists as they journeyed to their happily-ever-after. This is a book that will keep you rooted to your seat and shocking you into breathlessness as each scene unfolds. I absolutely adored this gritty, heart wrenchingly emotional and soul shatteringly romantic story that starred protagonists who initially hated each other with a vengeance but then as they come closer, the layers of misunderstandings are brought to light and age-old beliefs are challenged. This book was the first "enemies-to-lovers" book that I read and while I have always been wary of such books, I was totally bowled over by this one. Beautifully narrated, expertly developed characters and a story that had my heart breaking, Bound by Hatred by MV Kasi is one of my favourite books of 2018 as well as one that changed my perception of the "enemies-to-lovers" theme of books. I have become a big fan of MV Kasi and can't recommend this author enough. If you havent read any books by this author then you are missing out on memorable storytelling and books that are sure to make their place into your list of favourites like this one, that has proudly joined its predecessor in Njkinny's list of the Best Books of 2018. A book that invokes strong emotions in readers and is the best enemies-to-lovers book that I have read so far. You will hate and love the characters with a burning passion feeling as if they are real people. It is no easy fete making a reader feel like this and this ease with which MV Kasi made me invest in this story is what has made her a fan for life. 5 out of 5 super duper shiny stars to this book that made me cry, laugh, pray and then sigh as if everything that was happening was somehow affecting me; and then left me wanting more. So eager was I to not step out of this story world that as soon as I finished this book, I didnt waste a moment in ordering the next book in the series! So Njkinny recommends that you don't wait and grab this book like now!